On a recent trip to Myanmar (Burma) I made a stop in the crossroads city of Mandalay. Linking the route from the south of the country in Yangon to the states of the north, in modern times the city has acted primarily as commercial hub for the trade of goods up the Irrawaddy River and overland in the region once known as Upper Burma. Curiosity determined my staying there: its very name evokes poetic images of a place filled with temples, monasteries and the last royal palace of the Burmese king. As I flew over the neighboring towns and villages before landing at Mandalay’s new international airport, I was struck by the sheer number of white and golden stupas filling the vista below. I knew immediately the nickname ‘the Golden Capital’ for the city was most appropriate. King Mindon was known as a ruler devoted to the practice of Thervada Buddhism, and was revered and respected during his lifetime as a fair and just ruler. Among his accomplishments were the modernization of his army with a weapon making-forge, financial reforms including establishing a mint, the reduction in the income and authority of bureaucrats, and the construction of Kuthodaw Paya (1860-1866), known today as the World’s Largest Book. Its central stupa resembles Shwezigon Paya in Bagan. It is most relevant for its 729 marble slabs each housed in individual white stucco temples placed in a series of three enclosed parcels across a total of 13 acres. The tablets contain the Pali-language text of the Buddhist Canon known as the Tripitaka Texts. After King Mindon’s death his royal apartment was dismantled and converted into a monastery called Shwenandaw Kyaung, or the Golden Palace Monastery. It was moved to sit adjacent to the Maha Atula Weyan Royal Monastery, founded during King Mindon’s reign, outside the palace walls. Mindon Min’s son, King Thibaw (1878-1885), felt his father’s ghost in the royal apartment and wanted it to be positioned away from the palace. It is fortunate that King Thibaw removed the royal apartment: during World War II all the remaining palace structures were destroyed by the exchange of artillery fire and bombs between the Allied and Japanese forces. As is often the case in times of war, great monuments of a culture and its people are lost to the violent acts of man. Works of architecture and art suffer terribly, and the common identity that they represent to their citizens is often irreplaceable. Thankfully, this was not to be the case with the Royal Palace in Mandalay. Nearly half a century later it would be rebuilt. While a student of architectural history is only too familiar with the overbuilding and inaccurate redesign of monuments by those wishing to leave their mark on ancient buildings (for example Eugène Violette-le-Duc’s 19th century restorations in France), there is an argument to made in favor of the work carried out by the Burmese Archeological Survey Department of the Ministry of Culture. In 1906 the Myanmar Archaeological Survey, today known as the Department of Archaeology, was created. The department oversaw the historic reconstruction of the former Royal Palace in the 1990s, based entirely upon archival evidence and photographs for the palace as it existed during the reign of King Thibaw. When it was created, one of the department’s assignments was to photograph and document the remaining 40 buildings of the palace through drawings, scaled floor plans, elevations and cross sections. It was this evidence, in addition to surviving archival documentation recorded on parabaiks, or folded manuscript books, that was compiled and used during the reconstruction of the monument in the 1990s. What visitors see today is a recreation of the palace built to scale using modern building materials that are less likely to be damaged due to fire and exposure to the elements. For example, reinforced concrete posts have been constructed in place of the original teak posts used throughout the many palace interiors. The original teak roofing materials used during King Mindon’s reign have since been replaced by corrugated galvanized iron sheets. The finely carved teak exterior details of the palace have been replaced with less elaborate but more practical carvings. The paint scheme, too, reflects a more modern approach. Whereas in their original form the buildings would have been varnished with lacquer, or thitsi, and then gilded, the buildings are now covered in metallic gold paint. Similarly, using a red-brown synthetic paint instead of vermillion lacquer varnish that is highly vulnerable to the climatic extremes of the region provides an alternate solution to the ongoing cost of maintaining the buildings. One only has to travel a short distance beyond the palace walls to the previously mentioned Shwenandaw Kyuang (Golden Palace Monastery) to see how the carved teak design details of the original royal buildings appeared. Though the exterior gilding and lacquer has long since been lost to time and exposure to the elements, the interior still retains examples of both details. 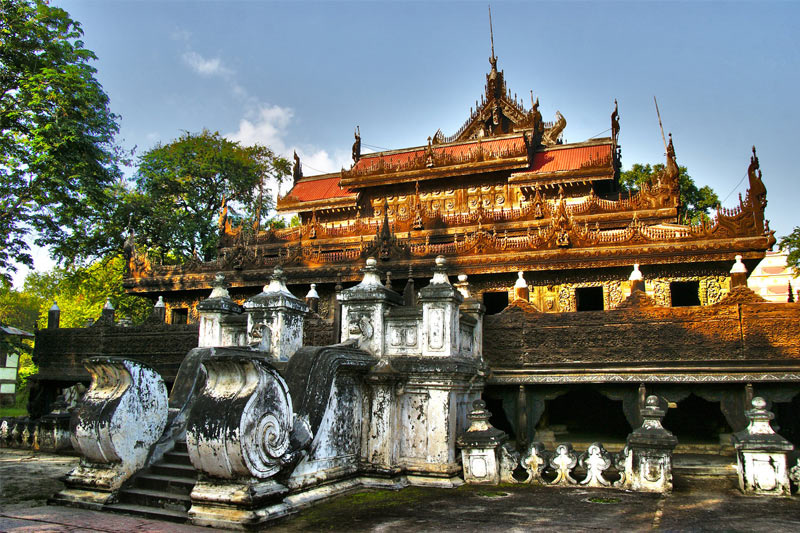 The freestanding building is the only remaining structure from the time of the last Burmese king. Fortunately, it has been preserved, and today it offers visitors, whether foreign or from across Myanmar, a sense of the level of detail and craftsmanship that went into creating the original nineteenth century palace and its subsidiary pavilions. The Royal Palace in Mandalay is a testament to historic preservation in a country whose recent history has been fraught with the fight for democracy by its people. Sites such as the Royal Palace, Kuthodaw Paya and the Golden Palace Monastery will continue provide future generations of Burmese with an acknowledgement of the great achievements of their ancestors. 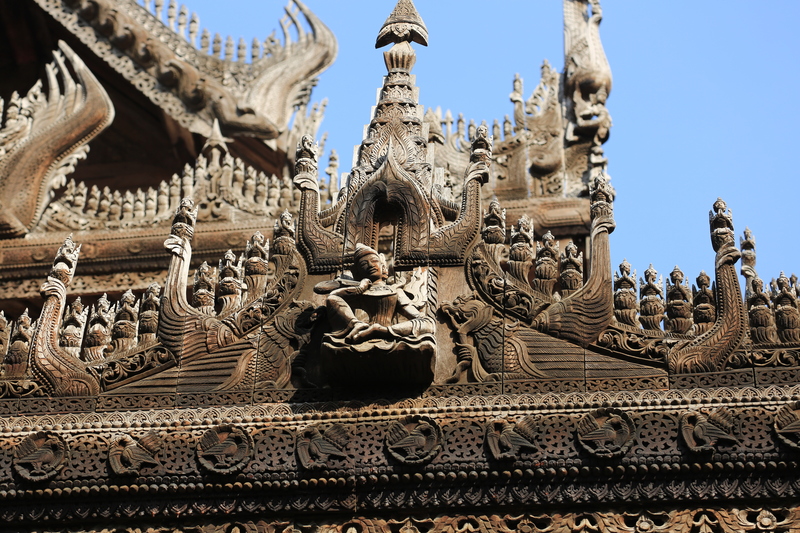 Details such as those seen in the intricately carved teak details of such monuments as the Golden Palace Monastery are symbolic of the lasting traditional culture of the Myanmar people. As the country now enters a new phase of national unification under the shared leadership of Aung San Suu Kyi, the relevance and importance of such places will certainly be heightened.